Patients with improperly functioning kidneys often need to undergo hemodialysis – the procedure of purifying blood in an artificial kidney outside the body – on a regular basis. Hemodialysis requires access to blood vessels, for the collection of blood and its re-introduction after purification. In this context, vascular access is commonly achieved with a so-called tunneled cuffed catheter (TCC). Accurate TCC placement is important; incorrect positioning can lead to blood clots and induce central vein thrombosis. Assistant Professor Toshiaki Ohara from Okayama University and colleagues have now developed a device enabling accurate TCC placement. The researchers’ insertion support device accommodates for individual body shape differences and is expected to decrease the rate of TCC replacements – typically ranging between 8.9% and 56%. The device was made from a material called expanded polytetrafluoroethylene (ePTFE), having the property of maintained plasticity. It can be described as a bendable ribbon with holes (eyelets) spaced 1 cm apart; the holes allow making markings on the patient’s body with a felt-tip pen. The insertion support device was tested on 10 Japanese adult hemodialysis patients (6 men and 4 women with a mean age of 71.3 years) treated at Shigei Medical Research Hospital. 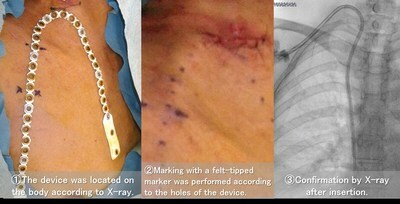 Placement of the device on the body took place with the help of X-ray imaging: the tip of the device, for marking the TCC entry site, was laid so that it overlaps with the right heart border. With the help of the markings made on the patient’s body, the physician could insert the TCC within an error of about 1 cm. The patients were observed for 2 months, during which there was no catheter replacement needed. The device of Dr. Ohara and colleagues helps to reduce catheter waste and the overall cost of hemodialysis. In addition, as the attachment of a catheter requires exposure to X-rays, it reduces accumulated radiation doses for both patients and physicians. Although the study was only carried out for 10 patients in a short observation period, the scientists ‘anticipate that this new device can be used for catheter intervention in many fields’. Hemodialysis, also known as kidney dialysis or just dialysis, refers to the purification of the blood of a person with malfunctioning kidneys. In hemodialysis, blood is extracted from the body, purified from waste substances such as creatinine and urea, and re-introduced into the blood circulation system. For blood extraction and re-introduction, access to blood vessels is required. Vascular access is typically realized by an arteriovenous fistula (AVF), an arteriovenous graft (AVG) or a tunneled cuffed catheter (TCC). Access through AVF or AVG – both involve surgically created passageways between an artery and a vein – are generally preferred, because of better prevention of infection. Some patients cannot undergo AVF or AVG, however, because of heart failure or low cardiac reserve (the difference between the heart’s pumping rate and its maximum pumping capacity). For these patients, a TCC is the appropriate solution. Accurate placement of a TCC, crucial for its successful functioning, is difficult because of differences in body shapes. A team of researchers led by Dr. Ohara from Okayama University have now developed a bendable support device that helps placing a TCC on a patient’s body – the tool enables making temporary markings on the body, based on which the TCC can be accurately inserted. Toshiaki Ohara, Kazufumi Sakurama, Satoshi Hiramatsu, Toshimasa Karai, Toshiaki Sato, Yuta Nishina. New insertion support device assisted the accurate placement of tunnelled cuffed catheter: first experience of 10 cases. The journal of vascular access, 2018 May 1:1129729818771884. Assistant Professor Toshiaki Ohara, M.D., Ph.D.